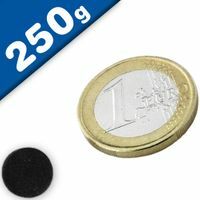 Ferrite Magnets are also known as Ceramic Magnets, Ceramic Ferrite Magnets are the best value permanent magnet available due to an abundance of raw materials and economical cost to manufacture. They are ideal for creating a deep magnetic field inexpensively. 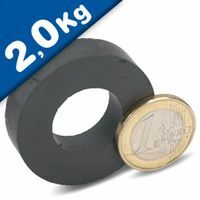 Ferrite magnets are extremely popular due to their characteristics. 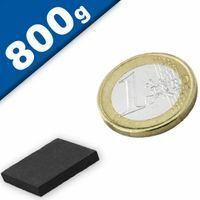 Ceramic magnets are a cost effective option for high volume applications. Ceramic magnet alloys offer good resistance to external demagnetization fields. Commonly used in motors, speakers and work holding assemblies. 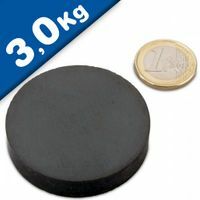 Buy ceramic magnets on-line today. 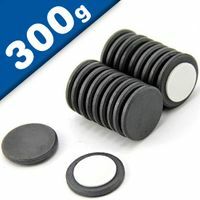 Magnosphere carries a large inventory of ceramic disc, block (rectangular & square), and ring magnets, available for immediate purchase in a wide range of shapes and sizes. 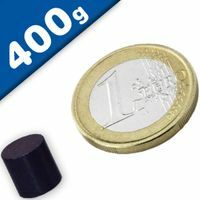 Ceramic magnets (also known as "Ferrite" magnets) are part of the permanent magnet family, and the lowest cost, hard magnets available today. 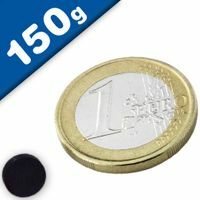 Ceramic magnets are used for many consumer & commercial applications such as craft projects, refrigerator magnets, badge holders, latches, display boards, motors, lifting magnets, science projects, toys, games, POP displays, advertising giveaways & much more. We can also custom manufacture ceramic magnets to fit your exact specifications using our in-house global manufacturing facilities and experienced team of engineers. 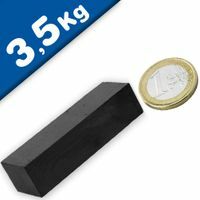 What are the temperature constraints for ceramic magnets? Ceramic magnets can be used at fairly high temperatures, although their magnetic properties drop with temperature. At 175°C (350° F), approximately 75% of their room temperature magnetic properties are retained. 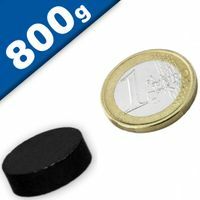 How are magnets rated? Magnets are typically rated by their residual induction, coercive force & maximum energy product. Click here for more details (section 4.0). This refers to the maximum strength that the magnetic material can be magnetized to. 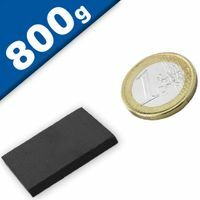 What are some common applications for ceramic magnets? Common applications for ceramic magnets include raft projects, refrigerator magnets, badge holders, latches, display boards, loudspeakers, security systems, motors, generators & alternators, lifting magnets, eddy current devices, brakes, clamps, switches & relays, sweeper magnets, science projects, toys, games, motors, magnetic couplings, POP displays, advertising giveaways, promotional items, novelties & more. 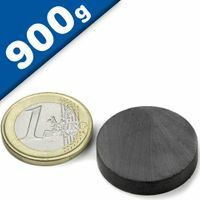 Are there machining constraints for ceramic magnets? Ceramic magnets require special machining techniques, and should be machined in an “un-magnetized” state. We are fully equipped to machine these materials to your specifications, just let us know what you are looking for by sending us a special request. Are surface treatments required for ceramic magnets? 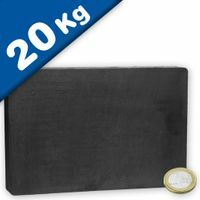 Ceramic magnets do not need to be protected for surface rust. A thin film of magnet powder on the surface is common. 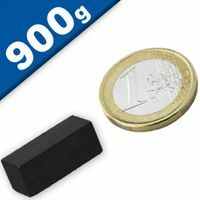 What are some bonding applications for ceramic magnets? 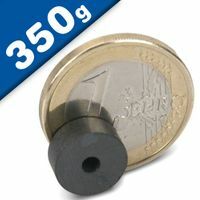 Ceramic magnets are often assembled into products using "superglues" such as Loctite 325 or other epoxies. Please always ensure that bonding surfaces are clean and dry prior to bonding. 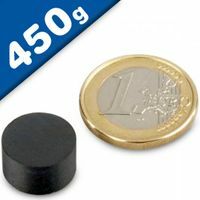 What safety precautions should be taken into consideration when working with ceramic magnets? Ceramic Magnets are hard & brittle, and they can chip or break if dropped or snapped together, so please take special care when handling these magnets! Magnosphere offers Ceramic Magnets in a variety of grades, including Ceramic 1, Ceramic 5, Ceramic 8, and Ceramic 8B in strengths ranging from 1.05 – 3.8 MGOe. Ceramic magnets are very resistant to corrosion. Coatings can be applied for cosmetic reasons or to reduce the fine, ferrite powder which is associated with ceramic magnets. Ceramic Magnets are susceptible to demagnetization when exposed to temperature extremes. There are grades which have better resistance to high and low temperatures, but several factors will dictate the performance of a ferrite magnet. Although most commercial magnets are anistropic, which means they have a preferred direction of magnetization, various pole configurations can be achieved without conflicting with a Ceramic Magnet’s orientation. Ceramic magnets manufactured by Magnosphere are compliant with Intellectual Property Rights, Environmental Restrictions, and Conflict Mineral usage. Ceramic Magnets are very strong and brittle, requiring appropriate handling and packing to ensure safety and prevent damage. 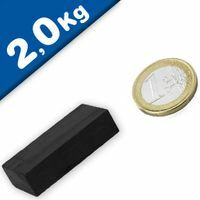 Ceramic or Ferrite Magnets are produced by calcining a mixture of iron oxide and strontium carbonate to form a metallic oxide. A multiple stage milling operation reduces the calcined material to a small particle size. The powder is then compacted in a die by one of two methods. 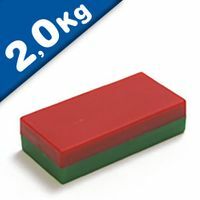 In the first method, the powder is compacted dry which develops an isotropic magnet with weaker magnetic properties, but with better dimensional tolerances. Oftentimes, a dry pressed magnet does not require finish grinding. In the second method, the powder is mixed with water to form slurry. The slurry is compacted in a die in the presence of a magnetic field. The applied field creates an anisotropic magnet which exhibits superior magnetic properties, but usually requires finish grinding. The compacted parts which approximate the finished geometry are then sintered at high temperatures to achieve the final fusion of the individual particles. Final shaping is achieved by diamond abrasives. 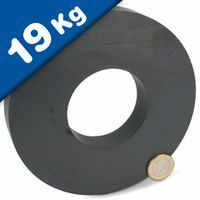 Usually the pole faces of the ceramic (ferrite) magnets will be ground and the remaining surfaces will exhibit “as sintered” tolerances and physical characteristics. 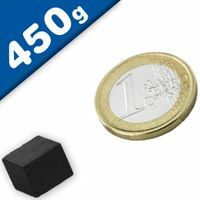 Who supplies high quality Ceramic Ferrite Magnets? Buy Ceramic Ferrite magnets at Magnosphere and get a better deal!